Much of the knowledge it takes to do well in culinary pursuits is rather cut-and-dried — consisting of the simple chemistry of salt and pepper of taste, and the meat and potatoes of math and science. Those lay out the basic ingredients for Linda Pearson’s students in the Culinary Arts Academy magnet program at Palm Beach Central High School. But when it comes to all the various parts of the food service industry — to which the program is a steppingstone for more than half of Pearson’s pupils — things can get a bit cluttered, like the kitchen of a beginner chef. The kids who don’t stick it out, as well as those who take cooking classes just as an elective, learn quickly that the industry isn’t for them. The cluttered-kitchen scenario is exactly what the intensive magnet curriculum is designed to avoid for students who have an eye toward the restaurant industry, either as a temporary job to help get them through college, or as a long-term career path. Pearson, a West Palm Beach native, joined the Palm Beach County School District in the early 1980s. To further her knowledge, she took courses through what was then Palm Beach Community College, as well as Florida Atlantic and Florida International universities. After the Fountains, Pearson went on to work at other country clubs, until she entered the education field in 1981. Much of her own on-the-job experience influences Pearson’s method and substance of instruction to this day. Her assignments after she started with the district added more seasoning to her recipe for education that Pearson brings to the table at Palm Beach Central. 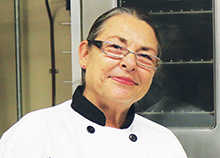 She was involved in the design of a mini-culinary “institute” in southern Palm Beach County. “I originally started working for South Tech, the school that I graduated from, and then I did 10 years at North Tech up in Riviera Beach, in an off-campus program, and then I went back to South Tech,” Pearson said. When South Tech was slated to close, the school district asked her to assist in the development and design of a new facility at West Boca Raton High School. “I volunteered my time and traveled throughout the state actually looking at designs for kitchens for instructional purposes, and then I was actually able to work on that committee for the district to design and develop that [culinary program] kitchen at West Boca,” Pearson said. She joined the staff at Palm Beach Central three years ago and is in her fourth school year now. Next spring, her program will graduate just over a baker’s dozen who’ve been studying with her for all their high school years. The culinary magnet program was trimmed from two teachers to one — Pearson — just as she started. But it still has a demanding curriculum, involving both catering and an actual eatery. The bistro starts up in January, Pearson explained, noting that organizational tasks dominate the first semester. The students also learn how to be safe in the kitchen. Getting the certification is a strategic move for students to do while in high school, Pearson said, noting that it costs approximately $500 to take that exam after graduation. While she encourages the teens who seem sure they’re aiming for a culinary career, Pearson exercises empathy with all and expresses caution to some, even though she said her main reward is “getting the kids to get involved in the program.” She tries to guide her students, not dictate to them. Veteran educator Mary Baldwin is among the first to arrive at Wellington Landings Middle School each day, and one of the last to leave. It’s not just because she enjoys teaching, of course, although that’s a big part of the reason. Although many other middle schools have similar programs, Baldwin doesn’t know of any others that are so extensive, offering the incredible range of activities available to Wellington Landings students who stay after hours because their parents work late or lack other options to ensure their children are supervised and safe after school. So many activities are available that the school has its own full-color program brochure that’s given to parents. The program has proved so popular over the years that activities are also now available before the regular class day, starting at 7:30 a.m. and continuing until breakfast at 9:05 a.m.
Born and raised in Gainesville, Baldwin earned her degree from Florida State University, married and moved to the area in 1984 with her husband, where they started a family. She has three grown children, and also a younger child, now in seventh grade. Baldwin was certain of her calling even at a young age. As a student, she was drawn to helping those younger than herself, often students who were slower to learn. “I’ve just always enjoyed working with children. I was good at it. I like kids — I love kids, actually — and to this day, probably one of the things I’m most proud about, is that after 34 years in education, I still love my work,” she said. Her involvement with students outside the classroom has much to do with that. She explains that the afterschool program is free to all who qualify for the free and reduced-price lunch program, with nominal fees for others. “You can get math help with a certified math teacher, and it’s only $3 a day,” Baldwin said, offering just one example. The school’s brochure only begins to list the dizzying variety of enrichments that students can seek out. Among the clubs are: academic games, anime, audio-visual, chess, debate, drama, environmental, future educators, majorettes, National Junior Honor Society, newspaper, twirling, yearbook and more. Then there are intramural sports, such as basketball, fitness/conditioning, flag football, indoor soccer, lacrosse, track, volleyball, weight training and wrestling. “Wellington is sports-driven. Kids play sports from very early ages. So to make any of the teams, it’s extremely competitive,” Baldwin said; thus, the afterschool sports activities at Wellington Landings are extremely popular. Other afterschool activities include cheerleading, creative cooking, dance, fishing, game room, golf, homework help, Minecraft, scrapbooking, sign language and step team. The Wellington Landings program draws accolades from students, parents and the school district. That’s a big source of pride for Baldwin, who uses a tight annual budget to run the activities. One component of the afterschool program is a series of built-in recognitions for students who might not otherwise stand out among their peers. The activities make such an impression on the children that, at any given time, 10 high-schoolers come back and volunteer to help with the afterschool program, Baldwin said. Among those students was Theresa Cameron. In her 22-year educational career, Ana Groover has spent 18 years at New Horizons Elementary School in Wellington. Through that time, she has picked up additional administration duties. However, after missing her time working directly with children, she began this year determined to spend more time with students. Groover is the International Spanish Academy coordinator at New Horizons. A native of Cuba, she arrived as a 6-year-old in Florida when her parents immigrated to the United States. She was raised in Belle Glade, which is also where she first taught in the 1990s, at Gove Elementary School as a dual-language English teacher who volunteered in the evenings to help adult learners. 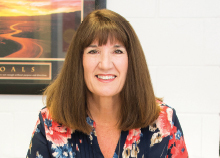 Groover earned her bachelor’s and master’s degrees in elementary education from Nova Southeastern University. When she started at New Horizons, Groover initially was an English for Speakers of Other Languages (ESOL) specialist, teaching science to older elementary school students. She was then given other hats to wear, including ESOL grade chair, testing/placement of English Language Learners (ELLs) and test scheduler. But she kept teaching kids despite the extra work, after gravitating almost completely out of the classroom. The other major responsibilities Groover bears keep her a busy professional, and she wouldn’t have it any other way. The labels on those hats have her swimming in acronyms, too many to define, and some that have gone away. She coordinates all ELL testing, plus the state’s Access 2.0 test, and is APRENDA test administrator as well. In addition, she is New Horizons’ administrative liaison for the Educational Data Warehouse (EDW), which holds all student records. “English Language Learners are the children who, when they get to us from other countries, they’re tested, and then according to the tests they’re placed in a room,” Groover explained. “There’s a plan drawn up so their instruction matches with their growth goals, and then they are reevaluated. I reevaluate them at certain times. There are actually guidelines from the government that we have to follow about how often and when they have to be reevaluated. The goal is to get them completely proficient in English. The way they determine that, Groover said, is through the battery of tests that she largely administers for the school. All that testing determines whether a certain moment has occurred for each student that Groover basically lives to make happen. “I just love to see when the light goes on in a kid’s eyes because you have all of a sudden opened up an avenue of interest for them and motivated them to learn. That often comes through language, also through visual,” she said. It’s what has kept her going back into the classroom for more than just supervising teachers; it’s why she enjoys her work. Under her leadership, the International Spanish Academy has grown to encompass three-quarters of New Horizons’ student population. The students get many of their lessons in Spanish. “When they leave us in fifth grade, they do get a graduating certificate from the ISA signed by the Consulate of Spain’s educational attaché in Tallahassee, and it gives them the right to study abroad,” Groover said. The ultimate goal then is met. In his 34-year career in education, Jim Marshall’s focus has widened far beyond teaching science concepts to classrooms full of students. It has extended to helping guide groups of kids onto purposeful paths that can gain them swift entry into the work force, set them on their way to a career or reduce uncertainties about their future upon entering college. 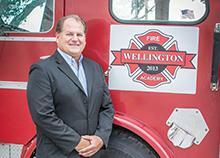 As the choice programs coordinator at Wellington High School, Marshall was instrumental in the founding and growth of the school’s groundbreaking Fire Science Academy, which graduated its first class of cadets last May. However, Marshall’s connection to WHS dates back decades. He started there the year the school opened in 1988 — as did his wife, Rebecca, in the math department. Born in Spring Lake, Mich., Marshall grew up in the Tampa area after his family moved to Florida when he was a child. He met his wife while earning his degree in environmental biology from Emporia State University in Kansas, where they married and taught at local schools for about three years. Originally, Marshall’s plan was to work as a field biologist for a government agency. “But the landscape had changed a lot from the 1970s. There weren’t many jobs out there, so I thought I’d do teaching as a part-time gig, but really fell in love with it,” he said. His first job in Palm Beach County was as a dive instructor, but he was looking to get back into the classroom. “I interviewed at four schools, and picked up a job at Spanish River High School. I taught there for three years and was the number two guy in marine bio there. When Wellington High School opened in 1988, Principal Jake Sello hired me to teach science, and I have been here ever since,” Marshall said. Over the years at WHS, he has taught several levels of marine science and Advanced Placement environmental science, plus has served as a department chair, activities director and assistant athletics director. But it has been from his experiences helping to design WHS’s Equine Pre-Veterinary Academy, and then establishing the school’s Fire Science and Fine Arts academies, that has brought Marshall the greatest satisfaction of his educational career. Based on the school’s strong science faculty, Marshall helped develop a program designed to give students a firm equine/pre-veterinary background. The idea for a Fire Science Academy arose in 2013 during the school’s annual “Shattered Dreams” production preceding prom, which is a mock teen fatality car accident staged with help from Palm Beach County Fire-Rescue. Marshall noticed several of his former students manning the rigs in the demonstration and got permission to do some research, during which he learned that many WHS alumni had gone on to become firefighters and paramedics. So, they decided to go ahead with establishing an academy. The academy is unique in Palm Beach County. While at least one other school has attempted it, WHS is the first to get the concept fully off the ground. “We are the first ones to put it all together and actually graduate, which we did this year, our first crop of candidates,” Marshall said. The Fine Arts Academy came about at the school district’s suggestion, but Marshall was thrilled to help get it established. The youngest of Marshall’s three sons, Ian, is on track to reap the rewards. He is a senior in the WHS Fire Science Academy this year. Next spring, he’ll experience the thrill of a graduation co-celebrated by future potential crewmates. Local firefighters played ceremonial parts in the academy’s first graduation ceremony this past spring. The life of local educator Anita Kane, co-founder of #1 Education Place in Wellington, has come full circle. Growing up in a private school setting, she has now created an educational institution to meet the unique needs of today’s students. As a child whose entire youth was spent on the 25-acre campus of one of the largest private day schools on the East Coast, located in the outskirts of Washington, D.C., Kane was exposed daily to the educational world her parents occupied full-time. They owned and ran the Potomac Country Day School in Maryland, founded four years before she was born. Growing up, the school was always a large part of life. So, years after she had left behind the educational community she grew up in, Kane joined with a former colleague to establish #1 Education Place. “Interestingly enough, that’s what we’ve really tried to create here — a community,” she said. Many of their clients are either professionals or athletes, as are a good number of the students. #1 Education Place, which serves students in first through 12th grades and sometimes beyond, now is going into its 16th year. It has around a dozen faculty members, serving between 40 and 60 students at any given time during the year, and a dozen or more during the summer. Kane went on to earn certificates from Independent School Management (ISM) in school policy design and implementation, and now is teaching mostly English at her school. She has also taught business communication, English, professional development and computer skills to adults in the past, but is now concentrating on her duties at the school. Yet the school remains very well known for its connections to the horse community. Her personal reward from her full-circle career has changed, though, since she first started the school. It’s partly because last year she lost her son, who taught math at the school. He went to sleep after a normal day last fall and never woke up. She has started a scholarship in his name. “So yeah, my focus has changed now. It keeps me alive; it keeps me happy. Always my focus has been, I get great joy out of giving to these children,” Kane said. What she gets out of it is a lot of gratitude and the joy of seeing their success. “To have a child who couldn’t succeed someplace else, or who everybody else thinks is a pain in the pitfeathers, and to be able to connect with that child, to be able to be a participant in somebody’s transformation, that’s my reward,” Kane said. For more information, call (561) 753-6563 or visit www.1educationplace.com. At Binks Forest Elementary School, children are receiving additional instructional time to assist in closing achievement gaps in reading and math. The students’ self-esteem and academic motivation have increased. In reading, 100 percent of the students in the lowest 25 percentile of test scores improved. In math, 95 percent of the students in that lowest percentile improved their scores. Somewhere up above, Keely Spinelli, the former principal at Binks Forest who passed away after a long battle with cancer in 2008, is smiling. That’s because the Wellington Education Grant named after Spinelli is working hard to help students across the community. Since 2013, the Wellington Village Council has allocated $275,000 to provide funding for the 11 public schools in the Village of Wellington to assist students in the lowest 25th percentile in reading and math. The Wellington Education Committee is responsible for monitoring and administering the grant. At their meeting in August, committee members will hear from all 11 local schools for 2016-17 grant requests. “Binks Forest is so grateful that we were recipients of the grant,” Levy added. The other 10 schools that have benefited from the Keely Spinelli Education Grant are Elbridge Gale, Equestrian Trails, New Horizons, Panther Run and Wellington elementary schools; Polo Park, Emerald Cove and Wellington Landings middle schools; and Palm Beach Central and Wellington high schools. Each school has used the money to provide additional resources and tutoring to students. Equestrian Trails Elementary School Principal Michele Johnson is also thankful for the Keely Spinelli Education Grant. Things weren’t easy at Equestrian Trails before the Spinelli grant was created. Spinelli worked as a teacher in the western communities before becoming a principal. The grant is a fitting tribute to an educator who was so dedicated to her craft. Reading and math were near and dear to her heart. Pasterczyk was assistant principal at Manatee Elementary School when she met Spinelli’s husband, Peter, who was a teacher at Manatee. At that time, Spinelli’s son Andrew was in kindergarten at Manatee, where Spinelli volunteered for special events — like the time she came in dressed as Cruella de Vil for Storybook Character Day and thrilled the students. At that time, Spinelli was principal at Belvedere Elementary School. Spinelli served on the board at Palms West Hospital and led the West Area Literacy Training Center. Due to her passion to teach children to read, her colleagues created a library in her honor for children at Palms West Hospital. Pasterczyk is very thankful to the Village of Wellington for the program. At Panther Run Elementary School, the Spinelli grant has allowed the school to provide students with tutors in the primary grades to supplement its reading program. This year, Panther Run added a math tutor. “I have had teachers in primary grades who have expressed overwhelming appreciation for the extra help that they have received from quality tutors to raise student achievement,” Panther Run Principal Pamela Strachan said. With the Leveled Literacy Intervention kits, Panther Run students in the program are given books to take home on a daily basis to read with their parents. Strachan taught with Spinelli at H.L. Johnson Elementary School in Royal Palm Beach. Professor Nicholas Palmieri is nearing his 30-year anniversary in the field of guiding adult students who are seeking more meaning and fulfillment out of life after devoting decades to nurturing careers and families. To this day, he is still is thrilled when such a student succeeds. 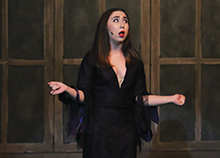 “When a student realizes that he or she has something important to offer in this world, and she finds the courage and the means to express all of what she has to offer through her unique set of gifts and talents, that is extremely rewarding,” Palmieri said. Palmieri is an instructor at Palm Beach Atlantic University. He lives in Royal Palm Beach with his wife, Tress. The couple celebrates 40 years of marriage this month. Palmieri is a professor of adult education, teaching in the Catherine T. MacArthur School of Leadership. He gives classes both there and at the main campus in West Palm Beach. He has also served as a faculty development coach. For 16 years before he joined Palm Beach Atlantic in 2004, Palmieri was on the faculty of the University of South Florida in Tampa. He grew up in the Pittsburgh area, earning a bachelor’s degree in counseling from California University of Pennsylvania, then continuing his education at Penn State to get his master’s degree. That experience got him interested in teaching adults, rather than primarily young adults, at the undergraduate level. He decided to get his doctorate at USF while working at the Florida Mental Health Institute. “It was there that I provided professional development for police officers and for public and private social service agencies that helped protect children,” Palmieri said. While there, he worked with a small group to develop a statewide instructor certification program, and earned his doctoral degree in educational program development with a specialty in adult education. Right now, Palmieri is teaching many empty-nesters who are transitioning, in many cases, toward second careers that more closely reflect their true passions. “Quite a few of my students are already in leadership positions — with the [Palm Beach County] Sheriff’s Office, fire-rescue services, with hospitality companies, with nonprofit organizations,” he said. Palm Beach Atlantic caters to people working full-time, offering a one-night weekly evening program. “It’s at both campuses, and master’s classes start back up again in the fall at the Wellington campus,” Palmieri added. The leadership school, which has had enrollees associated with Leadership Palm Beach County, aims to hone these adults’ altruistic instincts. 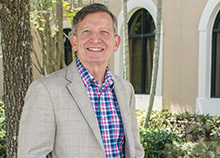 “Our Master of Leadership program is distinctive in that in addition to equipping students to cast vision, conduct thorough organizational assessments, develop strategic plans, and coach and consult, it helps them establish their own virtue-based foundation for leading with integrity, wisdom, courage, humility, altruism, hope and perseverance,” Palmieri said. He instructs multiple generations of students. Palmieri is proud to work with many local undergraduate and graduate students. In about two years, Palm Beach Atlantic’s leadership school will host a groundbreaking event for the county. It’s for both governmental and private-sector leaders, and there will be many different workshops and networking opportunities, he said. Palmieri, who turns 64 this month, isn’t ready to start contemplating retirement, but his interests outside education will be enough to keep him busy indefinitely. Last year, he took a sabbatical and began an initiative to help bring character development into secondary school curricula in El Salvador. That involved trips to Bogota, Colombia and Peru, and along the way he became enamored with Latin music. Now, Palmieri, who plays guitar, is also studying music online with the Berklee College of Music in Boston, taking songwriting classes, and has his own music publishing company called Suavoro Music Co. So, is he contemplating his own second career? “I love that question. I’m going into a new chapter in my life, and it has to do with elevating the quality of life for children and families in Central and South America. That’s one part of it. And the other part is [doing] the music to generate funds for my travels,” Palmieri explained. It seems that the dreams of his students have rubbed off on him. For more information about Palm Beach Atlantic University, visit www.pba.edu. 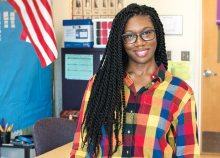 Now in her seventh year at Elbridge Gale Elementary School, teacher Khessia Jean-Baptiste is carving out a special space for students who lag behind their peers. Jean-Baptiste is teaching familiar lessons — ones she had to learn herself as a child — to a select group of these children as part of twin mentorship programs she recently started at the Wellington school. Growing up in New York, the daughter of Haitian immigrants, she was drawn to education at an early age, learning skills that later would come in handy helping her mother run a home daycare facility. She quickly learned that education would be a pathway to success in the United States. “My parents really, really pushed education, and put a lot on me to get it, because they weren’t English speakers,” Jean-Baptiste said. She arrived in Florida with her family in 2000, when she was 14 year old. She completed her education locally, graduating from Wellington High School and attending Palm Beach Community College (now Palm Beach State College) before earning her bachelor’s degree in elementary education at Florida Atlantic University. With support from her future colleagues, Principal Gail Pasterczyk offered Jean-Baptiste a position. Jean-Baptiste stayed teaching third grade for a while, until she ventured out on a different path. “I started studying for the Exceptional Student Education certification so I could become an ESE teacher,” she said. After completing the training, she taught half regular classes and half ESE classes until she decided that she wanted to give her full attention to ESE classes. “My classes are for kids who have learning disabilities or some other exceptionality. Usually it’s the ones who are slower learners, those with emotional behavior disorders or some other health impairment that affects their ability to learn at the same rate or the same content as other students,” she said. Jean-Baptiste explained that she is drawn to helping those children. “I like trying to find different ways to present things to them so they get it, because when they finally get it, it means so much to them,” she said. With this idea in mind, she created programs to fill this need. In 2013-14, she instituted the GOLD program for girls, followed this school year by the TAGS program for boys. The small group programs cater to girls who are often quiet and don’t advocate for themselves or ask for help, and boys who are often tardy, have disciplinary problems and are under-achieving. They are matched up with mentors from among about a dozen of Jean-Baptiste’s fellow teachers. She also invites outside speakers, all adult professionals, to address to the groups. “They talk to them about what they do, try to instill in them the importance of education and being motivated and responsibility and having your own drive and not always having people telling you what to do,” Jean-Baptiste said. The students meet with their mentors a few times a week, just to discuss problems they’re having, situations they’re dealing with and any social or emotional difficulties they’re facing. They’ll often role-play to learn different ways of coping with life’s setbacks. “I definitely like to focus on the social and emotional learning, because kids are smart. They learn a lot. If we’re not intentionally giving them positive social things to pick up on, they’re going to pick up on the negative,” Jean-Baptiste said. For girls, the mentoring focuses on esteem-building, goal-setting, learning how to navigate social situations, making more friends and maintaining those friendships, even social etiquette and dining etiquette. For boys, the lesson sets are a bit different: self-control, different ways to solve conflicts, the value of apologizing, being accountable for your behavior, dealing with frustrations and etiquette. Jean-Baptiste is planning an end-of-year luncheon where the students can invite someone important to them and must RSVP and dress up. All together, these activities add up to life and attitude training, not just education. And Jean-Baptiste thrives on seeing all the parts come together in her students before they head off to their next phase of education. It’s a safe bet that Daleen Torres won’t ever suffer from empty nest syndrome, even though her children are now grown and on their own. 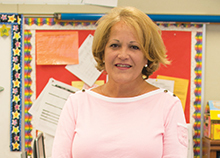 Torres tends a nest of fledgling Spanish speakers daily for most of the year, as a teacher of Advanced Placement and Cambridge Program classes at Palm Beach Central High School. Torres started out as a Palm Beach County School District substitute teacher back in 1998. She later became a permanent substitute before being promoted to a full-time teaching position. Now Torres is head of the World Languages Department at PBCHS. 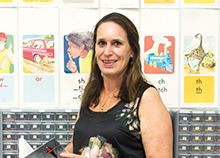 Married for just a few years at the time and with two young children, Torres began her time in Wellington was stay-at-home mother. She soon made friends with a neighbor, who began encouraging her to find a part-time job so that she could exercise her education and get some time out of the house. Torres completed that program in 2003 and received her permanent teacher certification. In 2007, she became national board certified in world languages, and a short time later became department head, where she now oversees eight other teachers. She is very proud of her work with the Cambridge Program. And these courses are not just for juniors or seniors. “Actually, the program is open for kids that are already maturing and they’re college-bound,” Torres explained, noting that Cambridge classes are open to freshmen, and at the AP level, there are actually more 10th and 11th graders. But Torres aims to be far more than just a Spanish teacher to her students. She sees herself as a mentor, encouraging their potential. Torres tries to explain to her students how important it is to follow up on their studies in today’s fast-paced world. Torres recommends that her students continue their Spanish studies after high school. Asked about the greatest reward she gets out of her career, Torres cites the fledglings coming back to the nest as full-plumed adults on a trajectory to success. This year’s Wellington Education series profiles some of the many educators who are expanding the minds of today’s students and tomorrow’s leaders.